Watch out, starwhales. There’s a new weapon for the interstellar dwellers whom you threaten with your planet-crushing gigaflippers, undergoing testing as we speak. This small-scale version may only be good for removing dangerous orbital debris, but in time it will pierce your hypercarbon hides and irredeemable sun-hearts. However, it would be irresponsible of me to speculate beyond what is possible today with the technology, so let a summary of the harpoon’s present capabilities suffice. 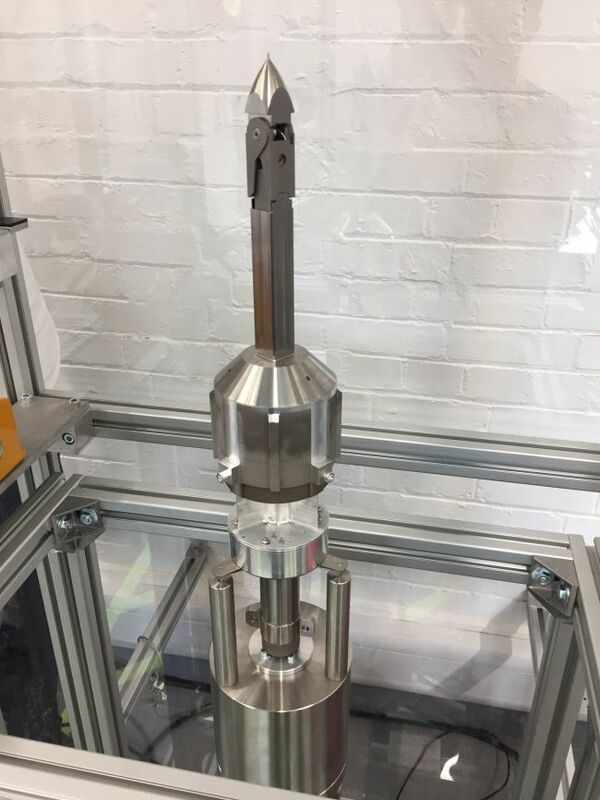 The space harpoon is part of the RemoveDEBRIS project, a multi-organization European effort to create and test methods of reducing space debris. There are thousands of little pieces of who knows what clogging up our orbital neighborhood, ranging in size from microscopic to potentially catastrophic. There are as many ways to take down these rogue items as there are sizes and shapes of space junk; perhaps it’s enough to use a laser to edge a small piece down toward orbital decay, but larger items require more hands-on solutions. And seemingly all nautical in origin: RemoveDEBRIS has a net, a sail and a harpoon. No cannon? The harpoon is meant for larger targets, for example full-size satellites that have malfunctioned and are drifting from their orbit. A simple mass driver could knock them toward the Earth, but capturing them and controlling descent is a more controlled technique. While an ordinary harpoon would simply be hurled by the likes of Queequeg or Dagoo, in space it’s a bit different. Sadly it’s impractical to suit up a harpooner for EVA missions. So the whole thing has to be automated. Fortunately the organization is also testing computer vision systems that can identify and track targets. From there it’s just a matter of firing the harpoon at it and reeling it in, which is what the satellite demonstrated today. This Airbus-designed little item is much like a toggling harpoon, which has a piece that flips out once it pierces the target. Obviously it’s a single-use device, but it’s not particularly large and several could be deployed on different interception orbits at once. Once reeled in, a drag sail (seen in the video above) could be deployed to hasten reentry. The whole thing could be done with little or no propellant, which greatly simplifies operation. Obviously it’s not yet a threat to the starwhales. But we’ll get there. We’ll get those monsters good one day.